It's been two months and I'm finally sitting down to write out all the little details of Ada's birth. Just like my pregnancy, her birth story is so much different than Ramsey's. The one similarity- I was induced for hypertension. 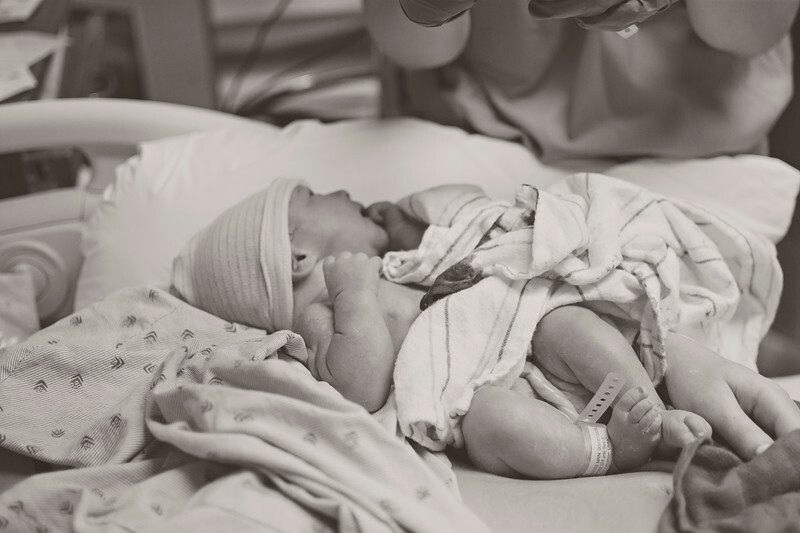 These issues began exactly a week after I was admitted to the hospital for preterm labor complications, so I was 33 weeks pregnant at the time it began. Protocol by my current doctor is to induce at 37 weeks after four hypertensive readings, which I quickly surpassed. So we scheduled my induction and plane tickets were purchased for my mom and sister to fly up. We woke up on August 3, 2018 with plans to arrive at labor & delivery that morning. Unfortunately for us, I received a call from the charge nurse at 7 am (we planned to leave only 15 minutes later!). She simply stated that we would need to come in later than scheduled, and to call back at 9 am for an update. I called back at 8:58 am, because let's be honest, we were all so anxious and ready to leave for the hospital at this point. We finally got an arrival time of 11 am, so my worst fear of not being induced that day was finally silenced. We arrived at the hospital and quickly checked in- it's amazing how much faster this is when you've been admitted once before. The resident on-call checked my cervix and geez- most uncomfortable thing I've ever experienced. Mom, Zach, and I finally came to the conclusion that it was because she had the shortest fingers EVER. She said I was only 3 cm and 25% effaced. I was honestly livid. 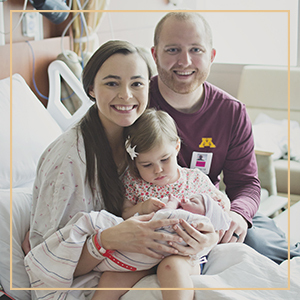 After my preterm labor complications I was labeled high-risk and required two ultrasounds each week along with an appointment. My cervix was checked each week to monitor my progress and I was consistently told I was 40-50% effaced. I was even told this during my hospital stay. Obviously it's subjective, but she was completely off. To top it off, the cervix check caused bleeding- which I've never had happen before. The decision was made to start misoprostol, a cervix ripener. My guess is that we could've bypassed this step if she wouldn't have said I was only 25% effaced... but enough of that. (Clearly still not over it two months later.) I received my first dose at 1 pm, and then my second at 3:15 pm. I was scheduled for a third dose at 5 pm, but my contractions were too frequent at this point to have another. Zach and I walked around after dinner in an attempt to get things moving. None of us (my mom and sister included) expected such little progress at this point. In fact, we had all guessed Ada would be born before midnight! Around 10 pm my cervix was finally checked again- and luckily there was a different resident on-call at this point. I was still 3 cm, but now 60% effaced. I expected to be much further because my contractions were consistent and stronger, but at least we weren't being told something obnoxious like before. 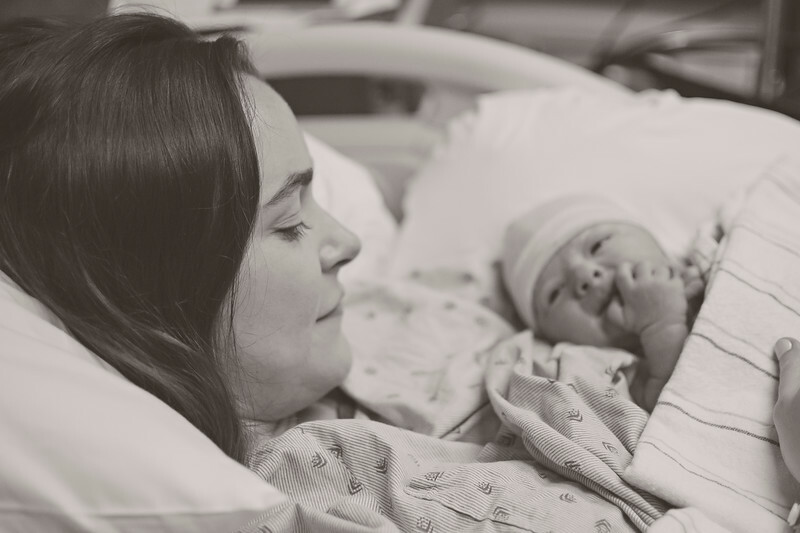 By the time my nurse returned to start pitocin, my contractions were becoming uncomfortable. I was already debating on when to get the epidural, and my nurse was completely supportive of me getting it at any point. I ended up asking for it over the 'push to call nurse' button after she stepped out of the room. I can't remember why she left the room before starting pitocin, but I'm so glad she did. We never started pitocin. While getting fluid for the epidural, my contractions became so strong I no longer needed it. So thankful my nurse didn't rush to start pitocin and was supportive of me getting the epidural beforehand. I never truly experienced a contraction while in labor with Ramsey- I received the epidural while I was only uncomfortable. This time around I truly felt my contractions. When you're in labor you will know, trust me. I now know what everyone talks about when they finally feel the relief from the epidural. I was so excited to see the anesthesiologist walk through the door. Terrified, but excited. I actually started shaking. I'm not sure if it was just the nerves or if I was cold from sitting up and not being under the covers, but I was shaking. The only way I was able to stop was by squeezing Zach's hand. I could feel the pressure of the insert, so a second numbing shot was given. It helped some, but I could definitely still feel the procedure. There wasn't any pain, just a really odd sensation the whole time. I was given a little remote to click if needed, which was allowed in 15 minute increments. It took several clicks to finally stop feeling contractions, and it worked on my back much sooner than my belly. My epidural started to feel really strong in my left leg compared to my right. My nurse attempted to turn me onto my back to help alleviate the feeling. As soon as I was on my back, my blood pressure and pulse tanked. I got extremely light headed and my vision became really fuzzy. I honestly thought I was going to pass out. I remember saying I felt really dramatic about the whole thing as my nurse hurried to roll me back over. Once I was back on my side everything returned to normal. Since I couldn't change position, my nurse brought a ball to put between my legs which made the feeling less noticeable. At 3:15 am the on-call doctor and resident came to check my cervix. I was 4 cm and 80%. FINALLY they were comfortable enough with my progress to break my water. As soon as she broke my water, I dilated to 5 cm. Things were finally moving now! At 4 am I started to feel my contractions again. They weren't painful, but getting more and more uncomfortable. I clicked the remote three times before I no longer felt them. I remember being hesitant to even click at all because my legs were SO HEAVY at this point. All the epidural seemed to be going to my legs- and I don't even know if that's possible. 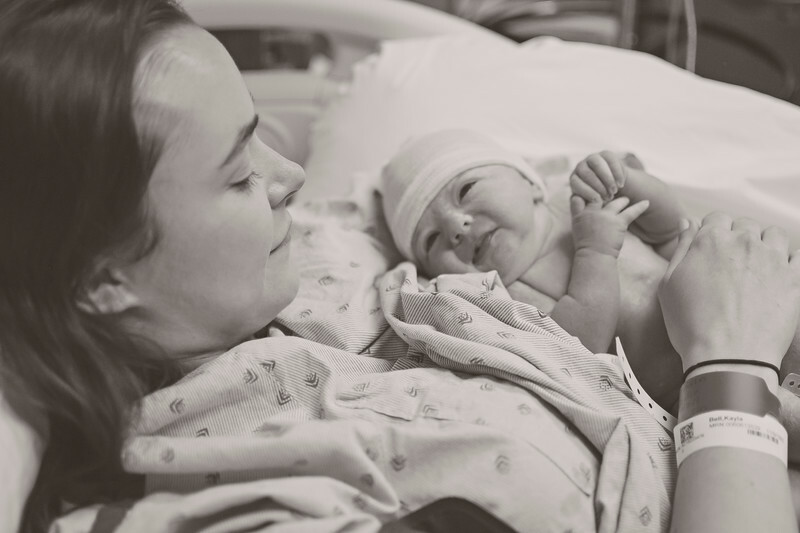 I knew my legs would only feel heavier with each click, but it was either that or risk feeling contractions the way I did before the epidural. So I clicked anyway and was finally able to get a little sleep. Shift changes were at 7 am. My night nurse (Alicia) walked in with my nurse for the day, and to my surprise it was the same nurse we had the previous day (Sara). We had really hit it off the day before, so we started chatting right away. I was actually eating breakfast when they walked in (yes, they let me eat the entire time!!) and she offered to sit me up so I could eat more comfortably. Both nurses helped sit me up, and then Alicia left. My monitors needed to be adjusted afterwards, so I lifted up my gown. As my nurse was trying to find the heartbeat, she commented on my belly. We assumed it was flat because my water had been broken. She felt around on my belly and then hesitated before saying, "I can't find your baby." I then joked, "as long as she's not in the bed." I HAVE TO STOP JOKING. My nurse lifted up the blanket and I thought she was kidding when she softly said, "and there's your baby's head." I remember looking down and seeing the back of her head, the teeny tiniest little head full of dark hair. "VIDEO CAMERA! VIDEO CAMERA!" I yelled this as my nurse rushed to the hall. Zach and my mom scrambled to find it as Alicia and Sara ran back into the room. "Is she okay? Is she okay?" I asked this several times to my nurses, and each time they said yes. Thinking back they probably had no idea if she was or not at this point. Seeing her little head laying there was the most terrifying moment of my life. She wasn't moving, but I'm sure that's normal- only her head was out. The next thing I knew the room was full of people. The cord was actually wrapped around her neck, and I wasn't able to push. The lower half of my body was heavily numb. I delivered her with two laughs, as Sara and I explained how everything had happened to Alicia. I was already crying before she was even out. Emotion flooded over me the moment I saw her little head laying there in the bed. I felt an instant connection to her as she was laid on my chest, something I honestly didn't feel the first time around. My first thought was how little she was. She was so alert and kept lifting her head to look up at me as I talked. Her eyes immediately caught my attention- they were clearly blue just like her daddy's. She was here! 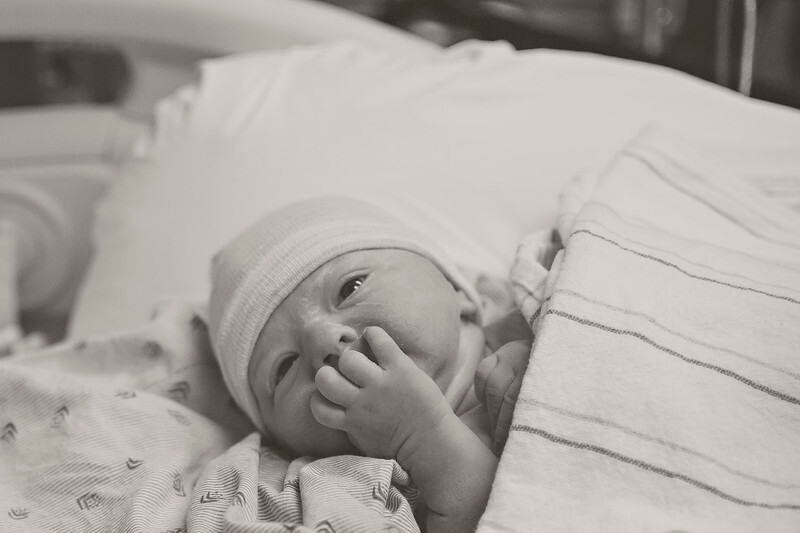 She was finally here after all the complications and scares- making an unexpected entrance into the world no less. If her entrance is any indication, our Ada girl is going to be full of surprises- and we wouldn't want it any other way.